Long before rap had its East Coast-West Coast feuds, there was another type of regional competition going on to define what makes a car a hot rod. On the west coast, customizers and dry lake runners drove the hot rod scene and achieved much of the notoriety and fame that still defines hot rodding today. In the rough and tumble South, hot rods were, by necessity, built for a specific purpose. 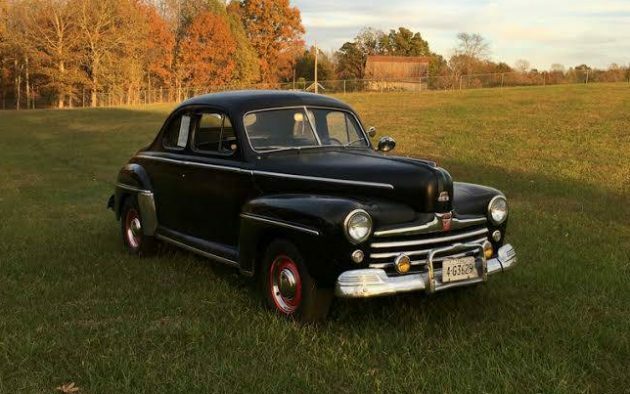 This 1947 Ford coupe, found on craigslist in McMinnville, Tennessee, is a perfect example of a ridge running hauler built for one purpose: outrunning the law. Survival for many families was tied to moonshining. Turning corn and sugar into liquor and transporting that illegal brew called for fast cars and brave drivers. Early hot rods in the South had three simple ingredients: unassuming exteriors, suspension modifications to carry heavy liquid loads at high speeds, and a motor that could scream through the hills when pursued by revenuers bent on stopping the illegal whiskey trade. Some enterprising souls even rigged up primitive James Bond style tricks installed to slow down pursuers such as mechanisms to drop tacks and oil, hidden police sirens and lights, and bright lights in the rear to blind pursuers. Given the mechanical abuse that cars such as this took, the likelihood of damage in chases gone wrong, and the law’s love for seizing all the tools of the moonshiner’s trade during arrests, very few have survived. 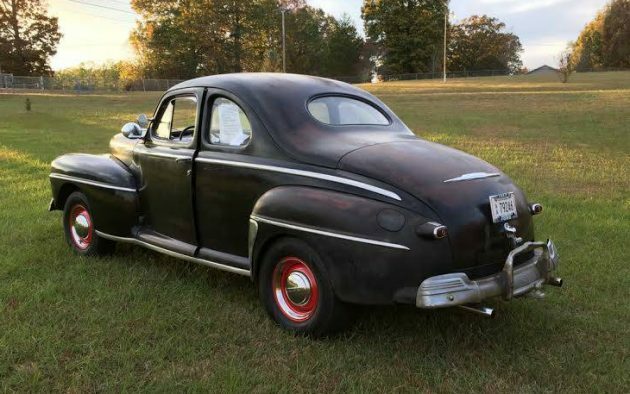 This documented example gives us a window back to a wild time in our nation’s history, and an excellent example of the practicality that defined hot rodding in the South. Starting with a 1947 Ford coupe, the previous legally challenged owner created a white liquor running monster for its day. 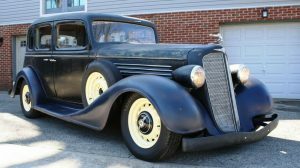 The factory flathead V-8 was yanked out and replaced with a 347 Pontiac mill, the transmission was rebuilt with stronger Lincoln gears, and the front brakes were swapped out with Lincoln brakes designed to handle a much heavier car. To improve handling, especially with the weight of what I assume from the ad was 50 gallons of moonshine (about 330 extra pounds), the car was fitted with heavier springs, a front roll bar, and an extra two shocks in the rear. Dual exhausts, of course, round out the package. While it appears to be unrestored, you have to wonder whether that is a good thing or a bad thing. 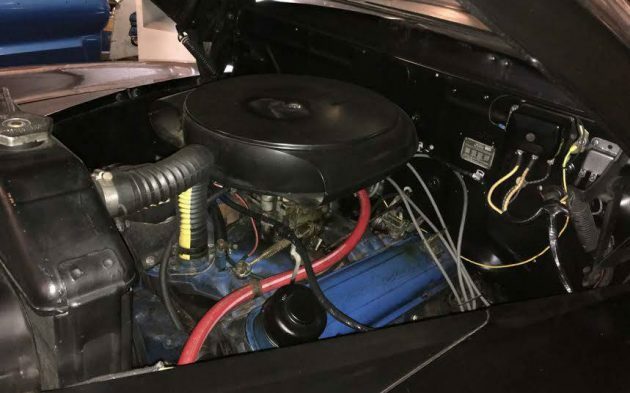 Having a bright and shiny restored car is nice, but it is doubtful that the car was in perfect condition when it ran moonshine given the disparity between the age of the car and the motor. All the bruises, scrapes, and added parts together tell a story that few completely understand about the postwar South. The pictures seem to suggest that the car has been pretty well taken care of since the end of its former career. It seems a shame to change anything. Would restoring it take away the magic? Excellent write up, Jeff. While I can’t condone the illicit use of booze, ( or any booze, for that matter) back then, you’ve GOT to admit, what they did to “get the job done” is really cool. This is a bit of a stretch. These cars typically had the flathead V8. The 347 was a ways off. It’s what they did to those flatheads. Multiple carbs, superchargers, some rum runners cars were supposedly putting out 500 horse. Couple that to a Columbia 2 speed, and no cop in the world could catch you. They stiffened up the suspension, so it rode level with all the booze. Cop radios were crude, at best, and score one for the bad guy, and the cops have been chasing them ever since. Cool car, just not period correct. Anybody? You’re right: not period correct. But the “pony-ack” makes it great! 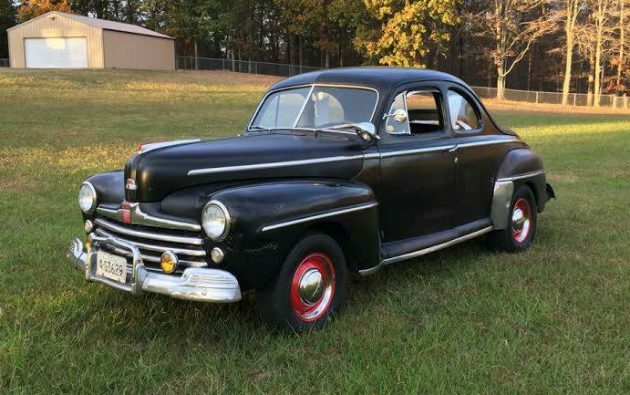 Pontiac had V8s from late 40s but because of internal competition from other GM brands theirs was not released for production until 1955 in a 347ci version. 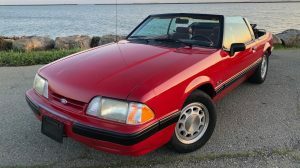 So the engine in this Ford is not period correct unless the builder knew someone in Pontiac and got an earlier Pontiac prototype. Bit of a stretch I have a 1955 Pontiac 347 that came out of a 1955 GMC firetruck. Read about it in Wikipedia. The 347 was a ’57 only engine. GMC used the 287 in ’55 and 316 in ’56, same as Pontiac. Based on the ad, it’s a 57 motor. Doesn’t say if the motor was in the body while running moonshine or not. Then again, it doesn’t say when the last run of white lightning occurred either. Interesting car none the less. Personally I’d leave it alone and run it as is. This car could have been built much later than is assumed- I pulled up photos of dirt track racing from the 60’s that included 30’s cars. Rum runners in the late 50’s were probably using cars of this vintage. I saw an episode of “Americarna” where they interviewed a bootlegger and profiled his 1940 Ford coupe. He was a retired Nascar racer everyone would know. Normally I would assume a cooked up story on a car like this, but if the double shock mod and Lincoln brakes were done back in the day, I’m convinced. Someone’s autograph on the dash, or anywhere else on a vehicle, almost always reduces the value in my opinion. This car included. I agree Fred. Just because it’s a ’47 doesn’t mean it wasn’t rebuilt for use as a rum runner in the ’50’s. Regardless, it’s just too much money for the car though. It is cool, as is. Dont change a thing. That would be a shame. I love the car, and the story behind. Nice find….. I don’t know who Jim Mitchum is, but Thunder Road starred James Mitchum. Robert Mitchum had a son, James and they both were in the movie as father and son. Off by about 90# on the weight of the booze (~420#), but an interesting writeup. Got my ’56 Chevy from a feller that lost his license forever for running liquor. Paid $350 in about 1974. It was a ‘Salesman’s Model’ with heavy duty everything and plywood instead of a back seat. The 265 had been bored out to 337, 3-on-the-tree and JCWhitney exhaust cutouts with the handle under the drivers side of the bench seat. A really cool element was the switch on the dash. Push it up and the brake lights came on, in the middle and the brake lights worked with the pedal and down and the lamps never came on. 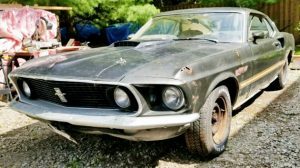 $25,000 is a little too much, but someone will pay it. Parts of the movie “Thunder Road” were filmed in Western North Carolina, near my hometown. 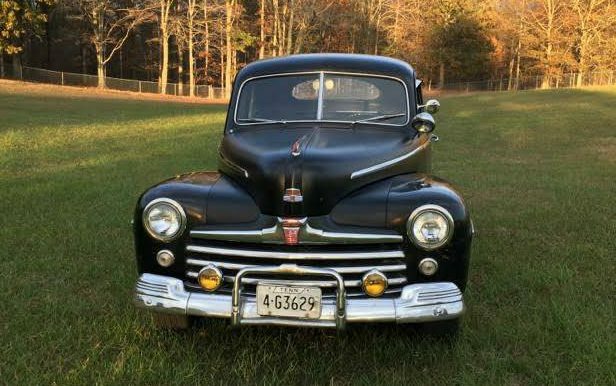 A friend of mine in Boone, NC owns (or at least used to own) the 1950 ford that was used as the police car in the movie. I’ll have to watch it again to see if I can see if this ’47 made it past the “cutting room” floor..
Nascar legend Junior Johnson was convicted of making likker in 1956, so its not out of the question that the car is period correct. The south eastern states, except around larger cities, where very,very poor. My uncle was caught making shine in 1930, they used a wagon to haul their load to the TN river. Poor people used what they could. I have a neighbor/friend who “back in the day” was basically forced into moonshine/running in order to support a family in a County with very few employment opportunities. He says that he had no desire to and never “touched the stuff” but it’s part of what it took to put a roof over his Familie’s heads, clothes on their backs, and what ever else that was not able to be sourced from his own land. When I am up at my house, if I catch him, I ask him to grab me for a “History Tour”. He has shown me some of his old still sites and some of their “drop” locations!!! Elderly gentleman that only did what it took at the time!! Guy is in his 90’s and still finds some kind of “work” to do everyday but Sunday! As for the car, as previous fellow Members have noted, it could go either way as far as authenticity goes. 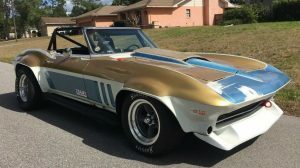 Cool car, cool mods, unfortunately not my “style”. Oh, and at that price, I would think it will be sitting for some time to come!!!! !